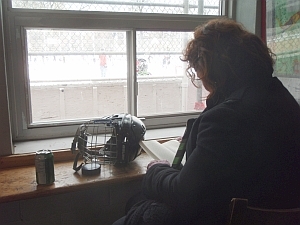 The non-skating mother of a young rink rat has been spending a lot of time at the rink during the holidays, sitting at the counter by the windows, reading her book and keeping an eye out. She said she's never had a chance before to see how diverse the rink world is. There are so many different ages and countries of origin -- and many different behaviours too. Today she saw the rink staff kicking out some loudmouth, reckless kids for the day. She said she can't believe some of the bad behaviour she's witnessed this week, even in quite young kids. But we told her -- wait and see -- some of those kids will turn out much better than you'd think. Rude kids from a decade ago are coming back to the park, with their own little kids learning to skate. The ex-troublemakers are often hard-working, friendly adults, who seem overjoyed to be back. That makes it worthwhile. But some of this current bunch of young ones are certainly hard to take. The ice is getting too thick, over 5 inches in some places, you can hardly see the dasher boards. There's been so much rain, and that made it higher. 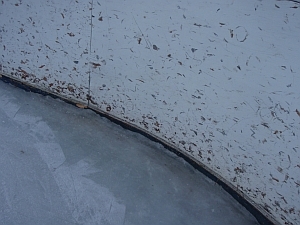 The zamboni drivers are flooding less, and cutting more. 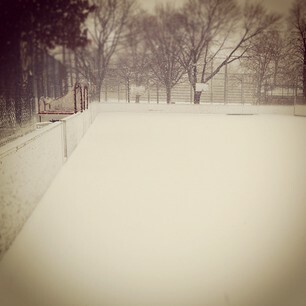 An "instagram" sent by J. Barduhn: “Well, there's about 3/4 of an inch on both sides of the ice. ;( supposed to scrape at 8AM, hasn't been done yet. Might be a while before we can skate." 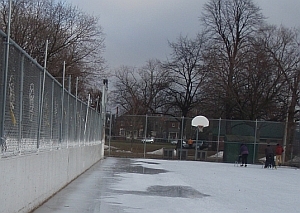 Today there's an article in the Halifax Chronicle-Herald, called "Lucky Torontonians get to skate in the rain." They're a couple of recent King's College graduates who got a contract with Halifax's main newspaper to do a trip visiting outdoor rinks from North Bay to Halifax, and then writing about them, accompanied by podcasts. Nice piece. I asked rink staff today if they know how the lockout would affect the Ward 18 rinks. They said that you told them that management is still working on the plans, and that it's a bit early to discuss what will happen. I hope you'll re-think that -- it's not at all early, it's pretty late. 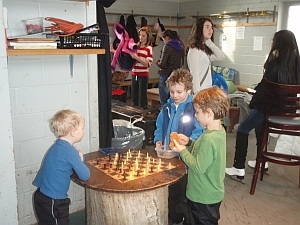 There are two occasions this weekend where the possible labour disruption will be much discussed -- at a community supper at Campbell Park on Saturday and at the Sunday afternoon campfire at Dufferin Rink. The biggest question I have is: does management intend to turn off the compressors if Local 416 is locked out? It's my understanding that the Tech services people are not 416, and certainly the Local 79 people have not had a "no board" yet. So if the compressors stay on, that means the Ward 18 rinks could continue to operate until the city locks out the remaining workers. 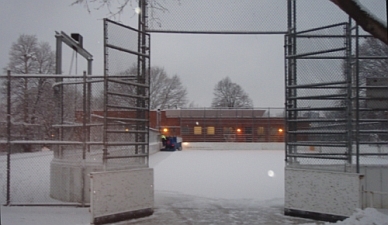 Snow would simply be cleared using shovels instead of zambonis, as with the city-sanctioned natural ice rinks. I'm told that CUPE members are prepared to volunteer with shoveling help. Please let me know management's current intentions regarding the compressors. I need this information by Wednesday afternoon because I want to include it in the Wednesday night market news. Permit holders want to know too. At this time it is premature to discuss the specifics of the City's contingency plans - the goal is to achieve negotiated collective agreements with the unions. The City's service delivery plans in the event of a labour disruption are still being refined. Once the plans have been finalized I will share them with you and the team. Until then it's business as usual. "If I were the mayor, I would give the workers whatever they need because people love the rinks SO much." So what do the workers need to make the rinks work well? 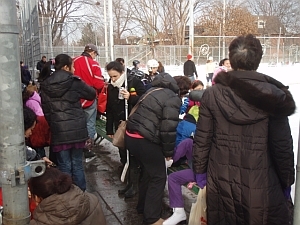 Rink workers woke up to the news that CUPE Local 416 and the City have settled on an agreement. Astonishment. But it means the rinks can run to the end of the season, or almost, if the City files a "no board against Local 79 on Tuesday. Local 79 is still in bargaining. photo taken Feb.18 7.30 a.m. This morning there was about two inches of heavy, wet snow on the ground. The zamboni driver was clearing it off the rink using only the zamboni -- very slow! The photo reminds of the one painted some years back by Sam Bietenholz.